Who has time to be sick? Who has the will to spend 5-10 days moping around with drippy, yet stuffed-up nose, body aching, can’t sleep but dead on your feet, head banging. No thank you! But how to avoid it? Well, 3 times this past week I pulled out my secret weapon. 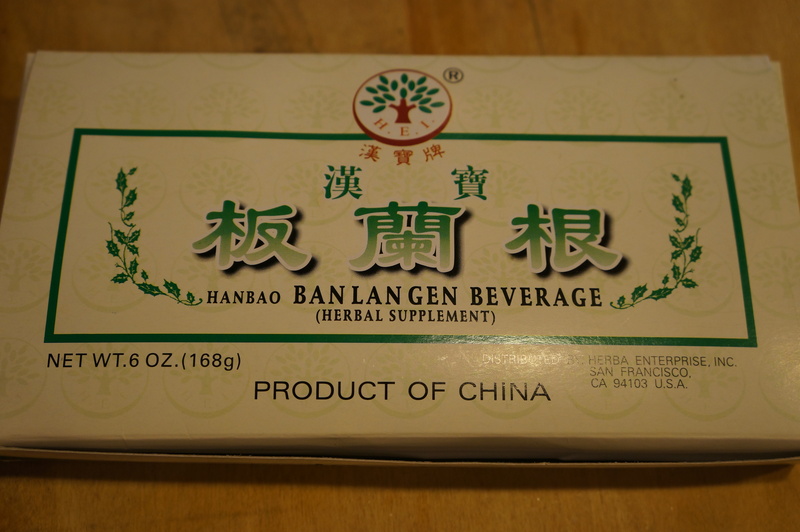 My acupuncturist, Angela Parker – Towering Pines Acupuncture, sold me this package of Banlangen which is a small box of little boxes wherein you find small brown sugar cubes to drop into hot water. The tea tastes good and I have found that getting one into me within 1 hour of feeling a few symptoms knocks it right out of the system! I have quite a stockpile of these little boxes – never want to be without it!! Isn’t it great when you find something that works, is cheap, and isn’t full of nasty pharmaceuticals? I avoid most food products made in China, but I’ll tell you, when it comes to natural medicines, I like to see Product of China on the label because those people know what they are doing! Much thanks to Angela Parker!